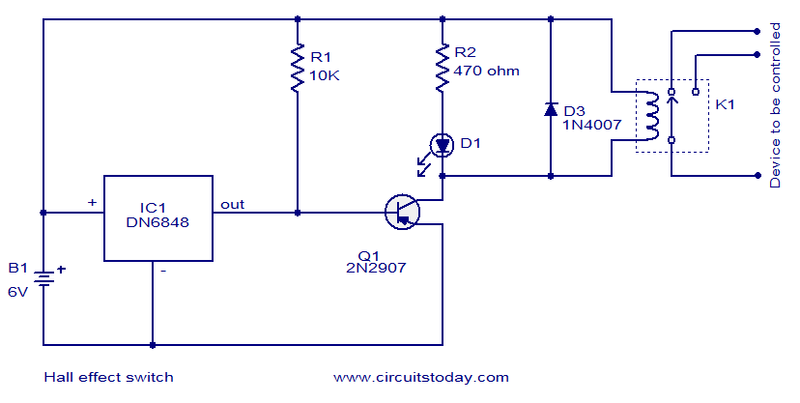 The circuit diagram shown here is of a Hall Effect switch. Hall Effect sensor IC DN6848 from Panasonic is the heart of the circuit. The DN6848 has a built-in Hall Effect sensor, Schmitt trigger circuit, power supply regulator and temperature compensation circuits integrated to a single chip. High sensitivity, low drift and excellent temperature stability of the DN6848 makes it well suitable for a variety of position, rotation and speed sensing applications. When the south pole of a magnet is brought near to the front face (face with type number marking) of the IC its output pin (pin 3) goes low (zero voltage).The pin 3 is connected to the base of PNP transistor Q1 and the low stage at pin3 makes the transistor ON and makes the relay activated. In a nut shell the relay will get switched ON whenever the south pole of a magnet is brought close to the Hall Effect sensor IC DN6848. Resistor R1 will always pull the base of Q1 to a very slight positive voltage and thereby prevents accidental triggering. LED D1 glows whenever the relay is activated and resistor R2 limits the current through the D1. Diode D2 is a freewheeling diode and it protects the transistor Q1 from high voltage spikes which are induced when the relay is switched. The circuit can be assembled on a perf board. The relay K1 can be a 5V SPDT relay. The wattage of the device that can be switched depends on the capacity of the relay. Hi Pitong Thanks you are correct it should be D2. Hi Art Thanks you are correct 2N2907 is a PNP transistor, collector and emitter should be interchanged and should be shown as PNP transistor, relay in emitter circuit. Sorry, I may be missing something, but to me it looks like the transistor is incorrectly placed. I’m sure that the emitter and collector should be the other way around? from the circuit description-“D2 was mentioned but in the schematic diagram,there is is no D2 but D3.maybe, clerical error!